Why does spray foam insulation interfere with termite control? Spray foam insulation unfortunately provides termites with a dense, spongy place to build their colonies, and it is very easy for them to tunnel through. It does not attract termites, but it does provide them a nice home if they find it. Improperly Installed Spray Foam Insulation Could Impact Ability to Inspect for Termites. Homeowners who have spray foam insulation currently installed in their home and have a pest control contract for termites should contact their pest control company to review their contract. Only 3% of buyers visited open houses according to the 2018 Home Buyers and Seller Generational Trends Report published by the National Association of Realtor. Safety is an on-going concern for real estate professionals whether you are sponsoring an open house or conducting a private showing of a property. Posted in Uncategorized	| Comments Off on Real Estate Open Houses – Good or Bad idea? I found these on the web through different source and I am not sure how much use they will be or the simplest or you to use, but don’t feel obligated to use any services advertised on this website. I will also continue to post any others I encounter. Do you know your rights as a landlord? 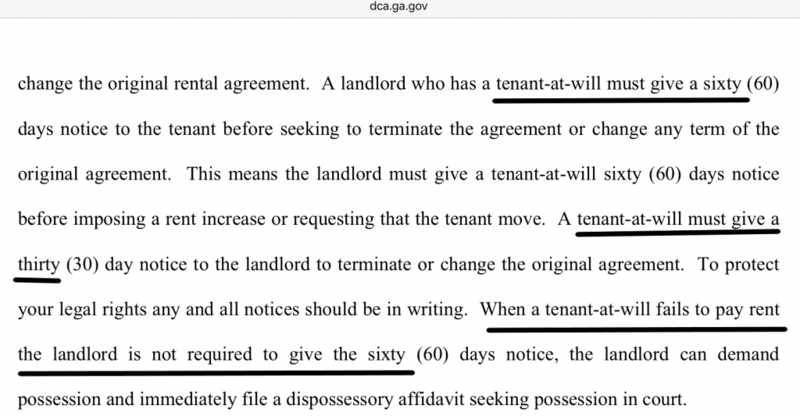 As a tenant? The Georgia Landlord-Tenant Handbook addresses each parties rights for residential rental properties. Please see one of my related blog posts: Are tenants liable for HOA fees? ﻿References to articles, sources, products, or services are not a specific endorsement and not guaranteed to be true or accurate. You should perform your own “due diligence and investigate” whether the information provided is valid, or the product or service is right for you. I welcome any or all comments that would help others. When an agent and broker partner together for a transaction, it’s extremely important for both parties to do their own due diligence. Because even if you don’t directly make the mistake, you could still be at fault. This actual scenario teaches us two lessons. First, don’t falsely advertise your expertise or claim you know an area of real estate that you don’t. And second, when working with another party, make sure you develop procedures and ask questions to prevent a lawsuit from occurring. References to articles, sources, products, or services are not a specific endorsement and not guaranteed to be true or accurate. You should perform your own “due diligence and investigate” whether the information provided is valid, or the product or service is right for you. I welcome any or all comments that would help others. The basics of real estate investing taxes are quite simple—organization and preparation. Tax Cuts & Jobs Act of 2017 introduced a new 20 percent pass-through deduction allowing certain business owners to deduct 20 percent of qualified business income if your taxable income is below $157,500 if single, or $315,000 if married. How do you increase participation to amend covenants?…possibly extend the time to vote to contact those who didn’t? Zillow begins buying and selling homes in Dallas… “Zillow Offers is helping transform the real estate transaction by giving consumers more of what they want – a seamless, convenient way to sell and buy a home, and on a timetable that they control,” said Zillow Brand President Jeremy Wacksman. 5 Things Real Estate Agents Should Know About New Construction Projects… For buyers, purchasing new construction can be intimidating. Often, they will deal with the builder’s own sales agent. The buyers, in turn, need their own agent who will look after their best interests. Without one, they will be exposing themselves to a lot of risks with what is usually their most significant investment. Real estate has no plans for effect of climate chang…the real estate industry has been slow to adopt standards to deal with the rising threat, according to a study published this week by the Urban Land Institute, a nonprofit education and research institute and Heitman, a real estate investment firm. Fannie’s decision to use real estate agents as appraisers is risky … Fannie Mae is now relying on real estate agents (not licensed appraisers) to measure and take photographs to determine property values for some mortgage refinances. Moving To A 55 and Older Community: Is It Right For You? I signed my house over to my daughter. How do I reverse that?Many people forget to actively transfer the title to their home into their living trusts. If they forget to take this last step, the title remains in their name; when they die, the property usually will have to go through probate court to transfer the title of the home. Some thoughts… Start the mortgage process of reviewing various mortgage lenders to see if any favorable specific programs fit your specific situation, how the interest rates, closing fees and costs, and other stipulations you will comply with under different loans. Rule of thumb, see as many lenders as you can within a 2 week period and the hit to your credit score will be minimal. Also, don’t overextend yourself and borrow more than you can reasonably afford. In addition, if you plan to be in the home for a long time, consider the option of “buying down” your interest rate at closing – ask your lender early about the cost of how you can reduce your interest rate by paying a small lumpo sum to reduce the interest rate. Why is representation so important in a real estate transaction? Transfer on death deeds pass real estate outside of probate…in Texas. Who’s Getting Lower Mortgage Rates? Real estate Q&A: How can sellers protect their money?…Do you have fear of losing your proceeds at your next closing? What Does A Real Estate Attorney Do For Buyers?…Try….Title Insurance Commitment and Outstanding Leins & Tax Issues??? Drones ; and The sharing economy and PropTech. Understanding how your property taxes are calculated…they are backed into determined by the tax funds they need to run the local governmental authority. 5 documents home buyers need to prepare before meeting a real estate agent( if you also add all the myths/beliefs about real estate and real estate agents). The real estate transaction is broken. Tech companies want to fix it… Has tech-world “disruption” finally come for the cumbersome process of buying and selling a home? Algorithm-driven home-flipping companies like Opendoor, along with strategic shifts by major companies like Zillow and consolidations across the industry, seem to say yes. The ultimate guide to selling your home without a real estate agent…Advice for selling without a realtor…Even if you’re selling without a realtor, you’ll still need to hire a lawyer to seal the deal. You’ll also need a lot of know how. Housing market trends are stifling the jumbo mortgage market…But now, recent trends taken a toll on the jumbo market, causing volume to fall 12% in the last year, according to a recent article in The Wall Street Journal. This outpaces the decline of the overall mortgage market by 5%. There are too many big houses on the market, and it’s a problem…“These days, buyers of all ages eschew the large, ornate houses built in those years in favor of smaller, more-modern looking alternatives, and prefer walkable areas to living miles from retail,” the WSJ noted. Freddie Mac and Fannie Mae (the GSEs) have adopted automated valuation models (AVMs) which use mathematical modeling, drawing on a huge database of recent transactions complete with property characteristics, to generate an estimated sales price. Builder Confidence Holds Steady After Recovering From 2018 Lows… NAHB says affordability still remains a key concern for builders. The skilled worker shortage, lack of buildable lots and stiff zoning restrictions in many major metro markets are among the challenges builders face as they strive to construct homes that can sell at affordable price points. Real estate information provider sues over alleged data theft…CoStar sues over secretly selling CoStar login details. Are these 7 tax tips and changes for property investors valid? Real Estate Advice: Tips for first-time home buyers…save for a down payment…maybe get a Buyer Agent? USGS report says half a million Californians, billions in coastal real estate at risk of flooding…maybe they built to close to the water to start with? New home sales drop 7% in January as housing market gets off to slow start in 2019…New-home sales declined to a 607,000 annual rate in January, according to government report delayed by the partial 35-day federal shutdown earlier this year. That’s how many new homes would be sold for the full year if sales were the same each month. The housing market has a growing affordability problem, and here’s why? Due to lack of resale inventory and insufficient construction of new housing, housing price growth outpaced income growth in recent years. Water damage is a growing problem in older homes…Flooding is becoming a major problem in older homes, but not because of inclement weather conditions. Instead, faulty pipes and valves, worn out hoses in washing machines, and poorly maintained connections to appliances that use water are to blame. Mortgage Rates Drop to New 14-Month Lows …Finally, the 10yr Treasury auction is a good gauge of demand for bonds. Higher demand for bonds means lower rates. The results of the auction were strong, which led to bond market improvement in the afternoon. After a certain amount of bond gains, mortgage lenders will typically reissue their rates for the day (with better terms, as was the case this afternoon). NAR Slams Wall Street Journal Op-Ed, Defends REALTOR® Value agents are no longer worth their present commission fees because “most buyers do the work themselves, spending months on the internet identifying attractive neighborhoods and homes before calling a real estate agent simply to open the door. NAR and Real Estate Brokerages face Class Action Lawsuit-National Association of Realtors (NAR) and four prominent real estate brokerage firms—Warren Buffett’s HomeServices of America, Keller Williams, Realogy and RE/MAX. The lawsuit charges NAR and the companies with violating the Sherman Act by only allowing listing brokers to list a property on an MLS if the listing broker makes a unilateral, non-negotiable offer of compensation on the MLS to buyer brokers. Real estate brokers cannot disclose from disclosing commissions offered on MLS, the lawsuit adds, and also allows brokers to take both buyer and seller commissions, if the buyer is not represented by a broker. REAL ESTATE MATTERS: Should family member charge for selling mother’s house?…It all depends on alot of factors…and you can reach an agreement between the agent, broker, and homeowner that would be fitting. Federal Home Loan Mortgage : Private Investors Encroach on Fannie and Freddie’s Domain…another bubble brewing? About 45% of mortgages originated in the January-to-September period last year went into Fannie and Freddie securities, according to the Urban Institute, a think tank. At its most recent peak in 2008, that proportion was 65%. Amherst Pierpont estimated that about 10% of Fannie- and Freddie-eligible loans issued in September 2018 could be more cheaply pooled into private-label deals. How “Amazon HQ2” Might Impact Real Estate… Property database curator ATTOM Data Solutions looked at a potential addition of 25,000 high-wage jobs in New York’s Long Island City neighborhood, and concluded that the move would have indeed provided real estate investors with new opportunities. Find out the real value of your house, for free… Realtor.com is very easy to use. Select Sell, enter your complete address, and then, Get Estimate. This site offers a cool feature. You can see potential profit or losses by breaking down several factors, such as the sale price minus real estate agent commission, or the balance owed on your mortgage. 63% of millennial homeowners regret buying home: survey—-unexpected costs aren’t the only reasons for regret. Homeowners also say that bad location, high mortgage payments, and buying the wrong size home can cause them to think differently about their purchase. Do Real Estate Lawyers Go To Court?… They should know how to go to court, they should not be going to court for the first time, and they should be comfortable at the courthouse. The Importance Of Nurturing Essential Relationships For Real Estate Professionals… Networking is essential for business and personal growth. You can now sell your Sacramento home with the click of a mouse. Who needs (listing) realtors anymore? 2019’s Property Taxes by State… The average American household spends $2,279 on property taxes for their homes each year, according to the U.S. Census Bureau, and residents of the 27 states with vehicle property taxes shell out another $440. US housing market off to shaky start in 2019 amid price dip, sluggish construction… average home prices in cities across the country, rose 4.7% by the end of December, down from 6% the previous year—for 2018, new single-family home constructions grew 2.8% in 2018, down from 8.5% the prior year. Zillow as mortgage lender: Real estate giant going ‘further down the funnel’ of buying a house…Thousands of would-be home buyers looking for a mortgage will soon have a new option: Zillow Group. Georgia Landlord-Tenant Handook…a guide to Georgi’a State Residential Rental laws. Home Depot sales cool along with real estate market in the final quarter of the year, Home Depot fell short on profit, revenue and same-stores sales as rising real estate prices cast a chill over U.S. home sales. What is a market appraisal? It is important to note that any market appraisal is not a proper valuation. They can’t be used with any prospective lenders to establish the market value of your property. Real Estate Advice: Don’t go for interest-only mortgage… After the first few, say five, years the interest on the loan, which is higher to start with, rises and your payments soar because you now have to cover not only the interest, but also the principal, at a rate that will retire the loan over the remainder of the 30-year term. Energy Efficient Mortgage Program…careful how simple this spunds…FHA’s Energy Efficient Mortgage program (EEM) helps families save money on their utility bills by enabling them to finance energy efficient improvements with their FHA-insured mortgage. Let FHA Loans Help You…straight from the HUD.GOV website…FHA loans have been helping people become homeowners since 1934. How do we do it? The Federal Housing Administration (FHA) – which is part of HUD – insures the loan, so your lender can offer you a better deal. I Just Became A Self-Employed Real Estate Agent — What Does This Mean for My Taxes?…Instead, you receive commission income, and at the end of the year, your broker provides a Form 1099-Misc, rather than a W-2. From a tax standpoint, that changes everything. Two more real estate investors, nine total, sentenced to prison for bid-rigging conspiracy…the two were each sentenced Thursday to serve four months in prison, with Vaughan receiving a fine of $20,000. Both defendants were ordered to pay restitution by U.S. District Judge Louis Guirola Jr.
Real Estate Agent Fees: Who Pays the Bill? How Do I Find My Property Lines?…Even if your property doesn’t have visible corner markers, you may be able to go hunting for those buried markers with a metal detector. The metal poles, often made of rebar, can be buried up to 10 inches below the surface. Use a metal detector until it indicates metal is there, then dig to be sure what you’ve found is the marker. Millennial Trends Re-defining Real Estate… How do you think the aspirations and dreams of millennials will shape the future of real estate? U.S. Housing Inventory Trends Now Favor Buyers in 2019… According to a new report by Zillow, after falling for nearly four consecutive years, housing inventory has turned a corner, growing on an annual basis in four of the past five months. U.S. for-sale home inventory grew 1.2% year-over-year. There were 19,455 more homes for sale nationwide in January compared to a year earlier. The housing market data released in January indicated that sales activity tapered off near the end of 2018. In December, sales of previously owned (existing) homes unexpectedly fell 6% from November and were 10% lower than a year ago. Overall, 2018 was the weakest year for home sales since 2015, as the effects of rising mortgage rates, high home prices, stock market volatility, and the government shutdown were felt late in the year. Homebuyer Assistance Programs Under Review — HUD says it’s time to investigate down payment assistance programs. Put these discounts on your calendar and treat a veteran! Veterans Day 2019 will be on Monday, November 11th, 2019. Local real estate agent fined over lead paint charge – (yeah, 2018 article but still applicable). Estate Planning and Tax Evaluations… Tara Cuffney from Costner Law Firm joins Paul to discuss law and real estate. Massachusetts real estate company to build group homes across state… Group homes are small, residential facilities within a neighborhood that are designed to look like a home and serve people with developmental disabilities. Home investor finds staircase booby-trapped with a knife…yet some scoff at real estate investors as scumbags…how about this previous homeowner…doesn’t he/she count as a scumbag? Google to invest $13B in real estate across the US…The tech giant announced on Wednesday that it plans to spend more than $13 billion in data centers and offices across the U.S., including major expansions in 14 states. Who’s your real estate agent really working for? It’s important to know. Private companies as guarantors for the timely repayment of principal and interest to investors of eligible mortgages that are securitized through a platform operated by Ginnie Mae. Family calls out Zillow over real estate mistake…Zillow corrected it once they became aware of issue. County Treasurer’s Family Bought Tax-Foreclosed Real Estate…conflict of interest? How to Avoid Taxes on Canceled Mortgage Debt… There are, however, exceptions and exclusions that may save you from the requirement to report canceled debt as part of your income. This startup just raised $5 million to automate the clunky real estate appraisal process… Cushman & Wakefield is now using the startup’s technology to automate and optimize the entire appraisal process, allowing its appraisers to provide multi-family valuation services (meaning for apartment complexes) at a much larger scale for the first time. What’s old is new and borrowed isn’t blue hair ladies…it’s the golden girls…even though this is a 2+ year old story doesn’t mean it has stopped working… Senior housing organizations across the nation are reporting a surge in demand from the young and old alike to move into the spare rooms of lonely and often lower-income elderly homeowners. Here’s why the housing market, while still risky, won’t be all bad for buyers in 2019…because the economy relies on people buying houses and you want to continue to hype it for home buyers??? Local real estate agent fined over lead paint charge…A local real estate broker who failed to tell a client about lead paint in a home was sentenced to time served, a $1,000 fine and restitution of $53,326. Rising tides, falling property values? Sample Home Electrical Safety Checklist…includes outlets, chords, fixtures, appliances, etc. Homebuyer Assistance Programs Under Review…maybe…HUD IG is not investigating these programs…which means they are ignoring fraud. What do you do if your house doesn’t sell? Does this still apply about a year later?? ?MBA Tech: Here are the biggest cybersecurity threats to mortgage companies right now… Among the worst things that could happen? A ransomware attack. Could Amazon break into real estate by buying Redfin? These are the worst cities to live in America. Is yours one of them?…and is this offensive to you if you live in one of them? Real estate Q&A: I have a reverse mortgage — can I still sell my house… However, if your home is worth more than the mortgage balance, that extra amount, known as your equity, belongs to you or your heirs. If the balance tips the other way and the loan is more than your home’s value, you or your heirs will have to turn over the house, but will not be responsible for any extra. Real-estate websites want to buy straight from homeowners. But is it really a good deal?… Opendoor and Offerpad bought more than 500 homes in Orange County, Fla., alone last year, according to an Orlando Sentinel analysis of transactions. Opendoor said it now represents about 3% of all sales in the Orlando market and is the largest seller making payments to real estate agents. Real Estate Advice: Think about the ‘five-year rule’ when buying a home… closing costs and real estate commissions required to buy and sell real estate will consume an estimated 7-15% of a home’s value. Unconventional Mortgages Predicting Housing Crisis? Unlikely, Experts Say… [Unconventional mortgages] allow for lower income ratios, higher debt-to-income ratios and alternative ways to come up with income for a loan (e.g., 12-month bank statements or even using assets to derive more income via formulas)…you know, otherwise risky borrowers leading to more defaults! Troubleshooters; Real Estate Deal Goes Bad, Buyer Still Waiting for Refund…here’s where a contract or a real estate agetn or attorney could have helped initially. Aging-in-Place Trend Contributing to Tight Inventories…Freddie Mac’ research finds that today’s seniors (persons born after 1931) are staying in their homes longer, and aging in place. While Millennials have historically low rates of homeownership the rates among seniors are high relative to previous generations. Real Estate Tip of the Week: Wire Fraud — Internet Crime Compliant Center saw a 480% increase in the number of complaints filed last year in the real estate industry. 7 New Year’s Resolutions for Your Home to Start Now…like tackle the little projects. Home Buyers Can Rejoice While Sellers Sweat for This Important Reason…sellers need to be prepared to lower their prices. Alleged real estate fraud targeted elderly LA-area victims… Prosecutors have now filed 162 felony counts against a Los Angeles woman who allegedly bilked millions of dollars from elderly property owners and others through real estate and financial fraud. Here’s How Much Real Estate Agents Earn In Every State…As of January 2019, the average annual earnings for real estate sales agents was $41,289, according to salary.com. How much money real estate agents make per year, however, depends on several of factors, such as number of real estate transactions, and commission fees. Real estate pro, victim of hackers, warns public after losing $25k in online theft… She thought she had been talking with a title loan representative until she noticed a one-letter difference in the emails she’d been sending and receiving. Appraisal Threshold for Residential Real Estate Loans. The Appraisal NPR (Notice of Proposed Rulemaking) proposes to increase the threshold for residential real estate transactions requiring an appraisal from $250,000 to $400,000. Evaluations would be required for transactions exempted as a result of the proposed threshold. Agents and Brokers: Here’s What You Need to Know Ahead of Tax Season. Home-Price Growth Continues to Slow…The S&P CoreLogic Case-Shiller National Home Price Index, which measures average home prices in major metropolitan areas across the nation, rose 5.2% in the year ending in November, down from a 5.3% increase reported in October. New real estate technology allows closings to occur in 3 days or less…The entire process from when you release the property until the closing can all be done on one platform. Realtors Expect Pending Sales to Improve in 2019… Yun says despite the low home sales in December, he is confident that the housing market will see improvement in 2019. “The longer-term growth potential is high. 4 Real Estate Investing Strategies: Which One is Right for You? Who controls the data that fuels real estate deals?…One of the elements of the arrangement was increased access to data from local and regional multiple listing services for nontraditional real estate brokerages, which has helped propel the growth of online portals like Redfin, Zillow and Trulia. Zillow branching out from real estate data, providing home estimates, to flipping property in Denver…The real estate data giant is now purchasing home in six cities: Phoenix, Las Vegas, Atlanta, Denver, Charlotte and Raleigh-Durham. How to Seal or Repair Cracks in Concrete Floors & Walls…different methods and materials. Real Estate Radio Hour weekly real estate radio program on air. Real Estate Settlement Services Industry Needs Technology-Driven Efficiencies. House-flipping is down, Wall Street Journal frets. If the speculative bubbles deflate naturally and gradually, there is much less risk of a recession or worse. The more speculators who get into the market for anything, the worse it is for the public who would like to buy a house without chasing the market. The Supreme Court of Georgia found that “when a closing lawyer purports to act merely as a witness” they are in violation of Georgia’s ethical rules governing attorneys. O.C.G.A 15-19-53 states: …nothing contained in this Code section shall authorize any person, corporation, or voluntary association other than an attorney at law to express, render, or issue any legal opinion as to the status of the title to real or personal property. Anyways, the off-market real estate is where the game is played and if you want to be taken as a serious investor, then you need to have a conduit to these deals. So, Democratic Mayor DeBlasio was ready to give the go ahead to slum landlords until someone more intelligent started asking questions. Denver is the fourth market where Zillow now directly buys homes, prepares them for showings and quickly lists them for resale. Zillow Offers is currently available in Phoenix, Las Vegas and Atlanta, and will launch in two North Carolina markets – Charlotte and Raleigh – this winter. Post #1: Feds significantly expand investigation into all-cash real estate deals . Post #2: San Diego leads the nation with the most home price reductions this year. Post #: How To Capture The Millennial Market As A Real Estate Agent. Opportunity Zones allow investors to obtain massive tax advantages if they invest capital gains—money made on the sale of assets like a home, a business, or a piece of art—into “distressed” areas of the country where the post-financial crisis recovery passed by. But there are other factors at work as well: some 17%, for instance, reported a closing delay due to a USDA loan, 13% reporting a delay due to IRS income verification and 9% reported a closing delay due to a hang up for their FHA loan, all showing the outsized role the federal government plays in the housing market. Parents who can afford to help their children are not standing idly by as housing costs have increased. Around 8% of millennials who are no longer in school get help from their parents on the monthly rent, according to a March report from Apartment List. “One option clients have taken advantage of is the J.P. Morgan Pledged Asset Mortgage” This mortgage strategy allows clients to pledge assets in their J.P. Morgan portfolios in lieu of a cash down payment. With the securities and home as collateral, borrowers may qualify for up to 100% financing. “We’re seeing a number of clients turn to the Pledged Asset Mortgage as part of their estate planning strategy,” adds Mr. Stewart. Our hosts use this weekend before the holiday to slow things down and take your questions on the real estate industry. Bitcoin vs. Real Estate: Who Will Win In 2019? A couple from Kansas City, Missouri, recently lost a massive $130,000 down payment in a money wire scam that’s becoming increasingly prevalent in real estate transactions. The housing market is slowing as would-be buyers struggle with rising borrowing costs and a persistently low number of properties on the market. the housing market is seemingly entering a new chapter. Home sales are lagging, the pace of home price appreciation is slowing, and inventory that’s been stubbornly low across the country has seen spikes in certain markets, particularly on the West Coast. Can these companies still thrive if the housing market goes from a seller’s market to a neutral or buyer’s market? Real estate database company Zillow Group expects mortgage rates will rise significantly in the new year, predicting the 30-year fixed mortgage rate will reach 5.8% by the end of 2019. The rate currently stands at 4.55%, according to mortgage buyer Freddie Mac. U.S. Real Estate Market: Is The Bubble About To Burst, Or Just Getting Started? The U.S. consumer is seeing their incomes increase at steady rates and consumption is moving along with that. One of the items that consumers will continue to buy is real estate. “We’re still seeing above-trend GDP growth that is likely to slow as the impact of last year’s tax cuts wears off with higher interest rates,” said Calvin Schnure, the National Association of Real Estate Investment Trusts’ senior vice president of research and economic analysis. The auction will commence on Apr. 8th and buyers will be able to use Bitcoin (BTC) and Binance Coin (BNB) to purchase a beach-front modern mansion in the town of Casuarina in East Australia. Ohio Eyes Potential Blockchain Benefits in Real Estate Transactions…The County Auditors’ Association of Ohio (CAAO) announced Wednesday that it has formed a working group to determine how blockchain tech can be implemented at the county level to “more effectively” transfer real-estate deeds between parties. Wills, real estate, escrow top areas to be disrupted by blockchain…In real estate, for example, blockchain could be used for subdividing a piece of real estate into micro-ownership through a token. Another source: Ontario Bar Association Institute event “Operationalizing Blockchain: Legal Issues and Challenges to Consider” held on Feb. 5. How Blockchain Will be a Game Changer for Real-estate Industry… blockchain is an encrypted record of digital ledger where information is stored over the entire network. The data in a blockchain can be viewed and stored simultaneously, allowing the real estate sector to streamline their business processes. The information in a blockchain network cannot be meddled with, as data stored in the digital ledger is immutable. Promissing efficiency, accuracy, and security. Real estate blockchain set to go live in early ’19. New York-based ShelterZoom plans to launch a real estate application that will lets buyers and sellers transact deals over a blockchain-based network, which could make purchasing a house as easy as pressing a button on a smartphone or tablet. How Real Estate Is Breaking The Blockchain Mold… its primary purpose was to act as a digital time stamp. Post #1: Is it safe to buy and sell real estate on the blockchain? The most important value of the blockchain is that it gives traders the opportunity to directly share the database. With blockchain, power is decentralized and there is no central administrator or set of administrators. Post #2: Is Blockchain In The Future Of Real Estate? . Post #3: Real Estate and the Blockchain: A Transactional Perspective. Post #4: PayPal Alum: How Blockchain Will Change Investing and Why Real Estate Will Be First. Post #5: Nine Things To Keep In Mind About Blockchain In Real Estate.